I’ve been trying out a new brush (photo below) this week. It’s a sable blend from Rosemary & Co, and what’s unusual about it is the shape. It’s a 1/2″ dagger — an angled shape I’ve never used before. I first tried a Rosemary brush in Cambodia when Suhita Shirodkar lent me hers to try, and she almost didn’t get it back. I liked it so much I ordered one when I got home. It’s advertised as being a great brush for long flowing lines, and it is. But this was the only brush I used for my begonia painting, so it’s clearly wide enough for big washes as well. And what I liked most about it was the ability to draw with it too, both at the start and at the end of the painting (there are no pencil lines in this). The brush is so delicate that you can make a skeleton drawing, move into the painting, and then finish with more calligraphic lines. It’s a real beauty. I can see why many artists use these handmade brushes. Painted on Arches Rough, 300lb, 12″ x 9″. your painting is fabulous like everyday enjoy your posts. I too bought the same brush from Rosemary after reading Liz Steels blog I sure hope it arrives this week. thank you again fro sharing your work! Thanks so much Kathie. I hope you like your brush as much as I do. Mine arrived quite quickly so you should receive yours soon. Wowa. I want one too – and your talent to go with it. Lovely painting. Ah! I love my dagger and have been using one exclusively for 2 years… so glad that Rosemary made it up so that it is more readily available. If only I knew you were interested in one… I had a spare with me in Cambodia and would have loved to given it to you! I had read your original post but just went back and read it again. Now I see why you love these brushes so much. I wish there was a one-inch as well. Can you ask Rosemary for that too??? I have a French blogging friend you would enjoy tremendously and one of her brushes is from that company.. a #12 round. My begonias have had a hard 2 weeks.. The poor flowers are very thirsty. Who is your French blogging friend? I would love to find out. This is STUNNING! and it was done mostly with that brush? amazing. you are so talented. It is ALL done with that brush. Thanks Rachel! Beautiful work, and thanks so much for introducing us to this versatile brush! Absolutely fabulous!! I’m sure you must get tired with everyone praising your talent, but I will say it too, your talent is amazing and I so enjoy view your accomplishments. I’m glad you like it Janet. Thanks so much!! Beautiful painting!!! Someone was just telling me about these brushes, so it is nice to hear you touting them too. I’ll have to check them out. This one looks like a great shape. It really is a beautiful brush Joan. Amazing painting !the way you painted the background is just beautiful .I love how you play with shadows and create interesting patterns . I’m taking your craftsy class and I am learning so much. Thank you and I look forward to more online classes from you . I was given your blog contact from Monique one of your followers. I read your daily posts by email. 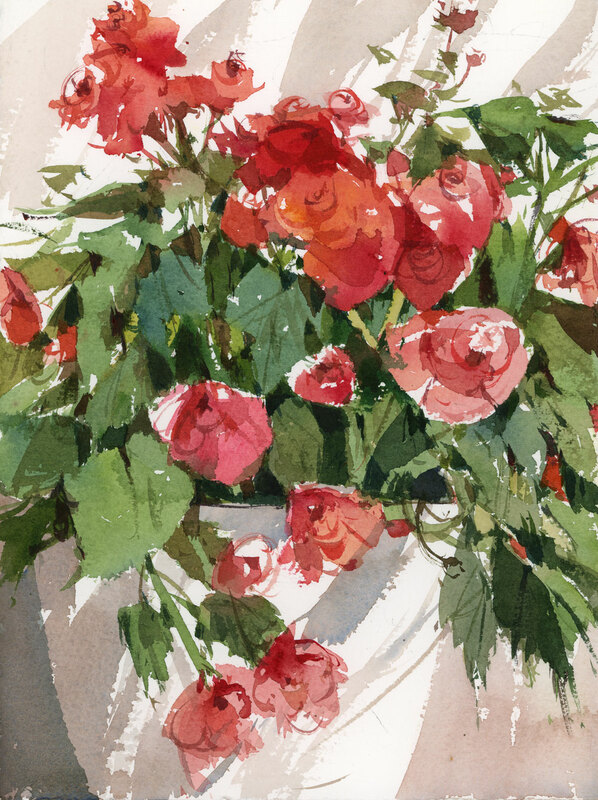 I don’t ever make a comment, but seeing the Begonias painted with that one large brush made me want to tell you how much I enjoy your style of painting. Also looking forward to seeing more people sketches with your Sharpie. I have her large squirrel dagger; a bit floppy but holds a lot of pigment. A bit stiffer might be more useful as you describe using it for an entire painting. Also bought her largest mop which really holds what I need for a 1/2 sheet sky and foreground…swoosh! and it’s on. After just finishing David Taylor’s workshop here in Oregon, I may try large squirrel flats for this purpose.